My three grandsons came over the other evening just because it had been too long since getting to hang out at grandma's house. The effects of another generation moving into our home last month and the extra time and energy it has taken for Papa and I has trickled it's way down to the younger three generations of our family. Everyone involved has had to make some sacrifices. Once we felt great-grandma was settled into her new home here I was just as anxious as the boys were to just hang out together in my home. They had invention crafts on their mind when they arrived. While the special tub where I store the invention craft supplies had been moved to make room for great-grandma the tub itself was just as the boys were used to. It was filled with all kind of inspiring objects! My table was quickly filled with supplies and the invention lab was once again open for business. 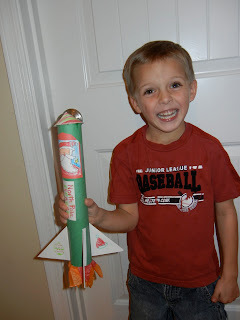 The youngest wanted to build a rocket. Not just any rocket but a rocket for Santa to get to and from the North Pole. could ride on the outside of the rocket! rocket sleigh soared through the long hallways. that picked up metal objects. Great-grandma interacted very well with the boys while they were here. When the boys left (sooner than they really wished) I was very happy to hear great-grandma say; "That was really fun!" Blessings to you for opening your home to another generation. Our local Children's Museum has a section called Invention Convention where children can create with paper, cardboard and odds and ends. It's one of my grandchildren's favorite spots. I'm so impressed that you have done the same thing in your own home!